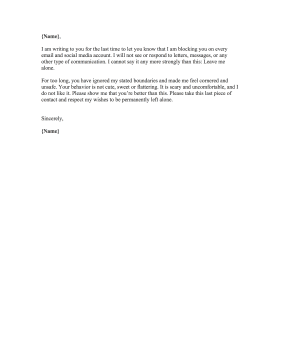 With firm and forceful language, this rejection letter lets a stalker know that their actions are harmful and that they should leave the letter-writer alone. I am writing to you for the last time to let you know that I am blocking you on every email and social media account. I will not see or respond to letters, messages, or any other type of communication. I cannot say it any more strongly than this: Leave me alone. For too long, you have ignored my stated boundaries and made me feel cornered and unsafe. Your behavior is not cute, sweet or flattering. It is scary and uncomfortable, and I do not like it. Please show me that you're better than this. Please take this last piece of contact and respect my wishes to be permanently left alone.